Chateau Haut Batailley has been a family affair for most the 20th century. However the actual vineyard of Chateau Haut Batailley is not all that old. In fact, it was created in 1942 when Chateau Batailley was divided into two separate properties for the two Borie brothers. Francois Borie kept the smaller part of the Medoc vineyard which became Haut Batailley. Chateau Batailley went to his brother, Marcel Borie. François Borie was able to enlarge the size of the Haut Batailley vineyards, due to the purchase of an additional 15 hectares of vines from Chateau Duhart-Milon in 1951. In 1953, after Francois Borie passed away, his daughter Françoise de Brest-Borie inherited Haut Batailley. She asked her brother Jean-Eugene Borie to manage the estate for the family. Following in his father’s footsteps, his son François-Xavier Borie took charge. Along with the help of his daughter, the charming and attractive Emeline Borie, they continued managing the property for years. In 2006, Francois Xavier Borie began a renovation and modernization of the wine making facilities and cellars. This allowed Chateau Haut Batailley to begin doing parcel by parcel vinification. This was a huge change for the estate. To understand how important this renovation was, you have to keep in mind that there is no actual chateau at the vineyard. Until the 1970’s, the wines were made at another Borie family owned estate, Chateau Ducru Beaucaillou in St. Julien. Once the wines were vinified, they were moved to Haut Batailley for the barrel aging. Chateau Batailley was ably managed by the Francois Xavier Borie Family who also own Chateau Grand Puy Lacoste until 2017. Things changed at the property in 2017 when the Cazes family, of neighboring Chateau Lynch Bages purchased the vineyard from Françoise Des Brest. The sale caused some issues as François Xavier Borie, who had just finished making the 2016, was also interested in purchasing the vineyard. Jean Charles Cazes took control of the estate in 2017. While he’ll be responsible for selling the previous vintage, 2017 will be the first harvest he is completely responsible for. The first change at the chateau was a facelift. The previously drab, sandy walls were painted bright pink. Now, you can see the chateau all the way from Saint Julien! The next step was cultivating 16 additional hectares of vines. 2 more hectares were planted in 2020. A needed renovation of the cellars is also underway. The best vintages for Chateau Haut Batailley are: 2018, 2017, 2016, 2015, 2014, 2012, 2010, 2009, 2006, 2005 and 2000. Much older vintages can be dicey. They are not wines I’d buy today. The 40 hectare Bordeaux vineyard of Haut Batailley is planted to 61% Cabernet Sauvignon, 36% Merlot and 3% Cabernet Franc. This is the second change in the vineyard. The previous alteration was to increase the amount of Cabernet Sauvignon. Under the Cazes family, the Cabernet was decreased and more Merlot was added to the vineyard. The vineyard located inland, off the D1, close to the south eastern side of Pauillac. You can divide the vineyard into 2 parts, with a portion of the vines planted directly behind the chateau on what is known as Petit Batailley. They share this part of Pauillac with Chateau Latour. The other part of their vineyard is due north on the Bages plateau, next to Chateau Lynch Bages. The production of Chateau Haut Batailley is traditional. 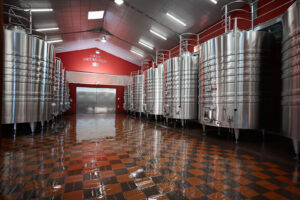 After destemming, the alcoholic fermentation takes place in temperature controlled stainless steel, 153 hectoliter vats. Malolactic fermentation takes place in tank. Chateau Haut Batailley is then aged for up to 20 months in 40% new, French oak barrels before bottling. There is a second wine, La Tour L’Aspic. The name of the second wine was inspired by a white tower located on the property that was created in 1875. The top of the tower features a statue of the Virgin Mary in French to “un aspic” which gave the wine the name of La Tour L’Aspic. For a period of time, the estate also produced a third wine, La Couronne, which was a parcel selection. But that wine is no longer made. 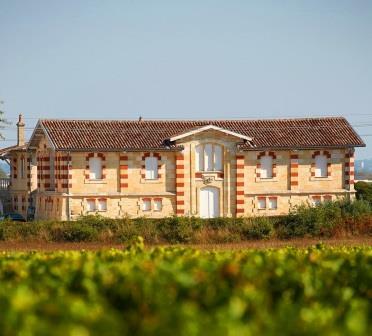 On average, the production is close to 9,000 cases of Bordeaux wine per year of Chateau Haut Batailley. Chateau Haut Batailley can be enjoyed on the young side with decanting. Young vintages can be decanted for an average of 1-3 hours, give or take. This allows the wine to soften and open its perfume. Older vintages might need very little decanting, just enough to remove the sediment. Chateau Haut Batailley is usually better with at least 7-10 years of bottle age. Of course that can vary slightly, depending on the vintage character. Chateau Haut Batailley offers its best drinking and should reach peak maturity between 10-18 years of age after the vintage. Chateau Haut Batailley is best served at 15.5 degrees Celsius, 60 degrees Fahrenheit. The cool, almost cellar temperature gives the wine more freshness and lift. Chateau Haut Batailley is best served with all types of classic meat dishes, veal, pork, beef, lamb, duck, game, roast chicken, roasted, braised and grilled dishes. Chateau Haut Batailley is also good with Asian dishes, hearty fish courses like tuna, mushrooms and pasta. With a good depth of color, the wine shows a nice purity of juicy cassis while a leafy olive and pepper component keeps you interested throughout this full bodied, crunchy and classic experience. The tannins are a bit uncompromising right now but give the wine time, and it will prove to be worth the wait. This is the debut vintage from the new owners, the Cazes family. The bottle was also sport a new, updated label design. Medium/full bodied, elegant, fruity and showing loads of peppery, cassis, dark ripe fruits and tannins. This is followed by a tasty, cedary, spicy, fresh finish. Give this 5 years and it will be really quite charming. Earthy, peppery tobacco, cedar and lead pencil notes on the nose. Close to ready for its prime time debut, this medium/full bodied, classically styled Pauillac delivers a straight forward, blast of sweet, juicy, crisp, fresh cassis in the finish. The wine was made from a blend of 76% Cabernet Sauvignon and 24% Merlot. Medium bodied, but not quite light, this young, tannic Pauillac serves up fresh blackberry, cranberry, tobacco and spice. From a blend of 76% Cabernet Sauvignon and 24% Merlot, this elegantly styled wine will be better with additional age. integrated, but it should not be approached for several years. Tasted January 2010. Tobacco, cherry and cigar wrapper on the nose, with a medium bodied, sweet, cherry and cassis finish that is already showing well today. With aromas of cassis, tobacco, blackberry and earth, this medium/full bodied wine is already starting to show well. Made in a lighter, bright, finesse style, the wine ends with juicy black and red plums in the finish. Smokey, spicy berries, leaf, cassis and tobacco scents make up the mature aromatics. Medium bodied, soft and ready to drink, the wine finishes with sweet, spicy olives and cherries. Barnyard, tobacco, mushroom and cassis aromas, this medium bodied Pauillac ends with a short, cassis filled finish with hints of green flavors. Completely mature sending out a nose of tobacco, cedar chest, forest floor and blackberry notes. Soft in texture, with a nice cassis filled finish, there is no reason to hold this any longer. With soft, round textures and no hard edges, this charming, medium/bodied Bordeaux wine offers tobacco, red and black fruit, forest floor and earthy notes. This is close to fully mature and displays good Pauillac character in the spice and cassis and plum filled finish. I'd drink this fairly priced wine over the next decade. Developing nicely with its tobacco, ash, earth, green pepper and spicy cassis character. There is a touch of rusticity in the tannins, but there is enough freshness and depth in the fruit, coupled with the charming nose, that it's easy to overlook. This correct, lighter style of classic Pauillac is past full maturity and requires drinking before it cassis and tobacco charm completely fades away. Already on the slow curve to fading away. Medium bodied, with more secondary notes of cedar, smoke, tobacco, earth and cigar wrapper, than bright red fruits. Some of the sweetness is gone, and there is a sharp, tang of acidity in the cranberry, cassis, spice and tobacco driven finish. Drink up, this is not going to get better with age. Paired against the Batailley, that was a markedly better wine.